here's part 2 of my quest to photograph all the old roselyn bakery signs that have been rebranded by their new tenants. 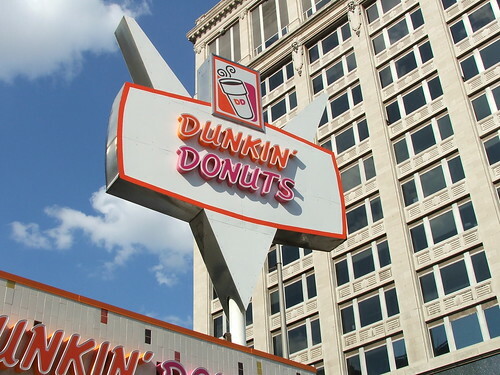 this one, in the heart of downtown indianapolis, was a panda express for several years and only recently became dunkin' donuts. the book indianapolis: then and now has a photo of the place back when it was a panda express. we have a copy in the living room; someday i may scan it. but for now, you can use amazon's "search inside" feature to see it. just follow this link to the amazon page and search inside for "panda express".